I enjoy listening to radios. I especially enjoy listening to stations I am pretty sure no one else in my neighborhood is listening. In elementary school I listened to KPEN, the first FM station in San Francisco. My parents had an old radio next to the front door that had shortwave as well as AM. I heard the men talking back and forth. I have had an interest in Amateur Radio since I first found the men talking were Amateur (Hams) on the radio in High School. I was first licensed during my last quarter of college in September, 1970. I married Karen, in October, and Ben was born during the next year. I had a 2 year, Novice ticket and used a separate receiver and EICO 90 Watt, down tuned to 75 watts, only on CW (Morse Code). The FCC liked to give out Pink Slips and I found I didn't like CW or the attitude of the band. My license lapsed. I was one of the first No-code Tech's, once my children moved out of the house. I was WN6DVV in 1970, KC6ZKD in 1991, AC6TW for a few months in 1996, and will probably end my career as AC6ZZ. In February, 2000, I acquired a Kenwood TS 430S (from my Elmer, Dave, N6YYM (SK)) the HF antenna Hustler 5-BTV trap Vertical on HF. In May, 2000, Karen and I purchased twin ICOM T81A quad-band VHF-UHF rigs in 2001 when she became KG6FPX,we talked frequently on 23 CM, but they were removed from our vehicle in January, 2004 during a convention. We replaced them with cell phones and have never gone back to rigs to contact each other. In June, 2007, I purchased a Yaesu, VX-3R, which is a great little receiver, a bit light on transmit even to the three repeaters 20 miles away on Mt. Diablo, simplex is impossible. Karen uses the VX-3R to listen to the Giants Baseball games. In 2012, I purchased an FT-60R for mobility with enough power to reach the repeater. The FT-60R is a basic, adequate rig and easily replaced at about $140. (In 2019, I would replace my FT-60R with FT-70R and go digital with Fusion.) In the summer of 2006, I rebuilt my HAM shack as I did in the Summer of 2017. In 2007 I added five gel cells, donated by Ed, my mechanic, to be able to communicate in a true emergency without the need of the power grid. 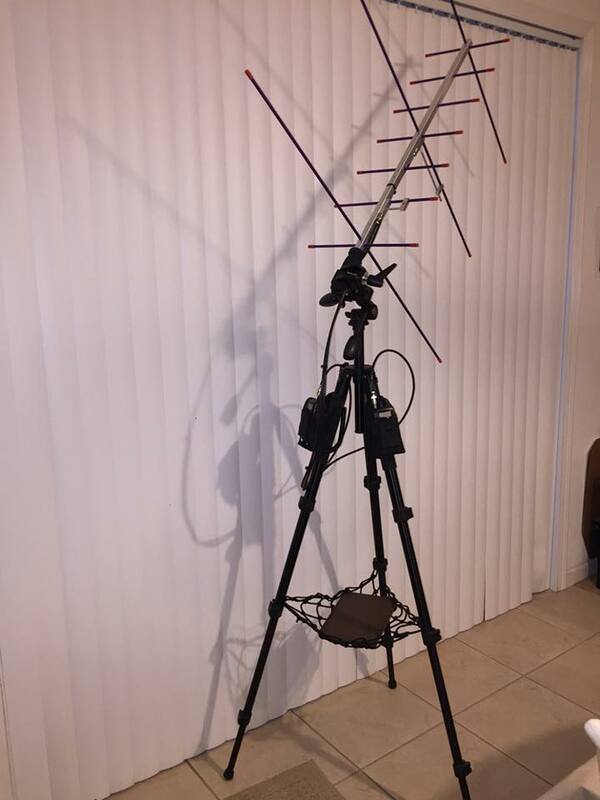 My good wife Karen, purchased a Yaesu FT 8900 quad band 10, 6, 2 and .73 cm FM rig for Christmas 2009. In the summer of 2013, I bought an Alinco DR-235MK// which put me on 222 Mhz, completing all bands from 160 meters to .73 meters. My most recent and versatile rig is a Wouxan KG-UV3D, 2-222 HT. In October, 2016, I purchased a Baofeng UV-5R for $26. It was too cheap not to buy and it is in my Go-bag. All my antennas except my HF wires are in my attic. I also added several VHF antennas are sitting in my attic on a 2x20 foot steel plate. In June, 2017 I acquired a ICOM IC-7100 all band, all mode rig with an all band HF rig including a AT-100 Pro// Autotuner. On January 09, 2019 I made my first D-STAR communication with the help of Jim, K6JM. I feel very fortunate to be able to have all this equipment at the ready. I received my first licence in 1970. My station was an EICO 90 watt, tuned down to 75 watts to stay legal in my Novice ticket. I had to change crystals (xtal) each time I wanted to change frequencies and then had to retune the grids. It was a pain and I didn't care for the FCC that was famous for their pink slips. When I got back into the hobby, I determined to go transistor, 12 volt and be flat foot. I do not use amplifiers outside the rig themselves. I have all the radios I want and need but continue to experiment on antennas. In 1979 the Barstow Search and Rescue team found me a step from dead in the desert with a broken leg. I do not have the energy or health to be part of the Search and Rescue here in Contra Costa County, but I am FEMA certified and work with the Sheriff's Emergency Radio Team, CERT, and SATERN. I usually check into a number of nets each week on Monday, and Thursday night. I check into the Tuesday digi net. Wednesday I try to check into the Red Cross net. You can see the details for these nets below. I gave a like-new Collins TCS-13 transceiver to the USS Hornet. You can now see it in the Radio Room on the ship docked in Alameda. Ok, so I am a HAM. What makes me different from say Citizen's Band or CB? CB a narrow band, About 500 KHz (0.4600 MHz) wide on 11 metres, around 27 MHz on your radio dial. They are limited, legally, to 40 narrow frequencies. In the United States of America CBers can use a transceiver of less than Five (5) watts output without a license of any kind. While there are many very nice CBers, the Band is known for profanity and crudeness. Amateur's are regulated both by law and are self-regulated so we talk as ladies and gentlemen. The CB band itself is quirky. One day the band can talk around the country with no problem, an hour later, it is hard to talk a block away. The band just "goes away". US amateurs are licensed by the Federal Communications Commission or FCC. On April 15, 2000 the United States went from Six classes to Three classes of licenses. All Morse Code Requirements were removed in the last days of 2006. Code is no longer a requirement for any FCC Amateur Radio license in the USA. 3. The Extra Class requires passing Elements 2, 3 and 4. Element four is a 50 question test. This license grants all privileges on all Amateur bands. It allows all frequencies and modes available in the USA. Amateurs in the USA can use up to 1500 watts PEP and can use U.S. Amateur Radio HF Bands from 2200 meters (below the AM band) to light. I was given a Kenwood 2/440 rig I use in my car. Personally, I find HF to be distracting while driving. I also monitor a dozen repeaters on two metres each day. I am now on 20 meters, 2 meters and scan 40, 1.25 meter band repeaters at home and 2 meters in the car. You will quickly notice there is a relationship between frequency and length of the wave. 60 Meters. Designed for Alaska, but all Ham's can use. 50 watts max. and it is suggested you transmit 1.5 Khz below stated frequency on USB. Many Amateurs are members of the American Radio Relay League or ARRL. 472 - 479 KHz Brand new band. No start date as of May, 2017. No data at this time. 300.00 = technically all frequencies above 300 Mhz are less than one meter, or microwave. Personally, I do not scan for police and fire. I can, I don't unless there is Police or fire action I can see. Next to the comment about "Oh, so you are a CB'er? People ask if I scan for Police and fire? I do live close enough to an emergency helicopter site, I listen to Air/Ground talk while they are on the ground, a football field away with my house shaking. But, no, I find Police and Fire boring. I am into Amateur Radio and scanning. What is the purpose of Amateur Radio? 1) Emergency communication, somewhere in my junk is a certificate from the American Red Cross indicating I worked in the Oakland, California fire of 1991. 4) Trained operators and technicians, self-education in intercommunication and fixing radios. We help on Jog-a-thons, 50-mile horse trips, parades, and other once-in-a-while community events that need communication. 5) International good-will, radio waves don't stop at borders, they travel the world and solar system. *) Anthony Stanton, AC6GM suggested I add a sixth purpose for Amateur Radio. It is fun, and it is fun talking down the street or around the world. unlike ladies that stitch in their homes alone, Amateur's can sit at home (or be on the road) and talk to others about the hobby or anything else we wish. Why do people get involved in Amateur Radio? It is said that there are as many reason for getting into amateur radio as there are Amateurs. Some do it to while away the long hours of driving trucks. Several Amateur's I have come to really appreciate drive all night from Reno, Nevada to Hayward, CA and home each evening. They can stay on the same repeater most of the way. For 10 years I had a paper route and would listen and talk on the same repeater while I drove my route. Another Amateur got his license to augment his cell phone while skiing the Sierras. Recently, a gentleman became a HAM to work on the Iditarod. I got my license just to prove to myself that I could do it, and to have intelligent conversation with someone other than a sixth grader. I love my middle grade class, but was looking for intelligent adult conversation. My wife, Karen, took her test and got into Radio just to talk to me. So what are the types of things "we" do in Amateur Radio? The following short paragraphs describe some of what a Licensed Radio Amateur can do in the United States. I would love to hear other uses I have neglected to mention. APRS Automatic Position Reporting System. Frequency is frequently on 146.390. This uses GPS or Cell phones to tell your location and show where all the other APRS HAMs are in the same 50 mile area. EME, Earth Moon Earth, takes location and distance from the earth to use effectively. BAND CONDITIONS One day I can turn on my transceiver and talk to the world. Another day, I can hardly make a signal off my antenna wire to a OM 1/2 mile down the road. Some enjoy fielding band conditions using various methods. See Beacons. BAND PLAN There are more than 700,000 Amateurs in the US and millions more about the planet. Furthermore there are many modes, AM, FM, SSB, digital, FT8, CW, Slow Scan TV, Fast Scan TV, uplink and downlink satellite and many other modes. The FCC gives us the band, we need or organize the band to make everyone happy. BAREFOOT Much like QRP, a HAM determines not to use anything except the equipment he has. If my rig puts out 100 watts, I use 100 watts. One can and many Amateurs do, use a "heater" or Linear Amplifier to knock the power up to legal maximum of 1000 watts. If you run barefoot, you run with 1, 5, or 100 watts of the rig, without a linear amp. BEACON'S Unlike standard AM and FM, shortwave people/stations and bands come and go on the radio. Sometimes we tune down a band and hear nothing. We do not know if there is nothing on, or the band is dead. A quick way to find out is to turn to a distant beacon or a satellite overhead and if we hear it, we are free to send a signal with a fair amont of certanty that someone will respond. There are times when the band is dead and no amount of CQ, will bring a station from around the corner much less around the world. Finding low wattage Beacons around the country on all sorts of frequencies is exciting for some. Many of these stations are on 100 mw (this is equivelant to a toy) but are frequently placed on mountain tops. Finding distant radio stations and beacons are things anyone can do. But it is something Amateurs do, there are groups of Hams that report on what beacon and weak signal (station) they can hear and or make contact. 1. One of the many things that can be done for entertainment on Maui, Hawaii is taking a bike ride down Haleakala. This takes several hours to wake up, get to the main meeting area, eat breakfast and drive up the mountain. Once on top, hundreds of people have to wait for the sunrise. I took this time to turn on my 5 watt HT. I talked to all the Hawaiian islands in under 30 minutes. Even my wife was impressed. 2. Actual comment on Facebook. "Several days ago I talked 40 miles between Antioch and Vacaville on 145.520s Years ago while traveling to LA on I-5, I talked on one (1) watt [Yaesu VX-3R] around 100 miles between a guy up in the mountains and my 70 mph car. 3. One Saturday evening, very late I flipped on my 20 meter rig just before falling in bed. I heard a station in Connecticut and we talked for five minutes before the band faded. Neither of us had exceptional equipment or antennas, and we were both more than surprised we covered the country like we were sitting in the same room. 4. There is a Maritime Net at noon most days. I felt myself lucky to talk to a 29 foot sailboat in the middle of the Pacific, headed toward South Asia. 5. I passed and received my Extra Class License back in the 20 WPM era. Never talk about it, but I wouldn't have it any-other way. 6. While the space shuttle was up, I listened to it contacting guys all over the country. One morning while throwing the Chronicle, guys in San Francisco got excited and I looked up to see the Shuttle between earth and sky in a non-earth-like purple glaze. It landed in Florida 15 minutes later. 7. I listen and can talk to satellites fly over head when I want. BUY & SELL and play with different radios, transmitters, equipment and antennas. CALL-IN FREQUENCIES Each band has a particular frequency one can call and look for someone to talk. This is related to SIMPLEX. CITIZEN BAND(CB)/FAMILY RADIO SERVICE(FRS) Neither of these very separate bands need a license in the US. Each band has a particular frequency one can call and look for someone to talk. This is related to SIMPLEX. CHIRP is a free, open-source tool for programming certain amateur radios. We once programmed our computers, now we program our HT's. CLUBS HAMs mostly sit at home and talk to people we can't see. Occasionally, we find people that have the same interests as we do. There are Missionary Nets (which is an on-air club), QRP, which is very low power clubs, We have a Delta Amateur Radio Club (Delta ARC), which are guys close enough to drive once a month, Microwave, EME, Earth Moon, Earth groups, and on and on. COMMUNICATE Traffic and weather and clarity of transmission are frequently the topic of conversation. We rarely talk about politics or religion. If one doesn't use their "Ham Call" we won't talk to them by law. This afternoon, 8 September 2016, I heard MANY sirens and got on my 2 meter repeater and in one question, found out there is a grass fire five blocks away. Never got near me, but the sirens said it was close. Could tell my neighbors where the fire was and satisfy their minds. COMMUNICATE CLEARLY As we talk, people go "Huh?" and one learns to speak clearly. We don't want to "walk" on others transmitting at the same time. There are rules, call signs, "Q" calls, someone needs to run the nets, all these things take a bit of work to sound professional and communicate clearly. CONTESTING. Some Amateurs enjoy Contesting OnAir Is one of several places I can get info on Contests. A second location, would be QST magazine put out by the ARRL. A third would be listening to other Amateurs talking about upcoming contests. In most contests the Amateur is trying to get as many other Amateurs on a certain frequency during a certain time frame. There us usually very little chit-chat. It is mostly pulling their call sign out of the static along with trading information on location and how clear they can be heard. CONVENTIONS AND SWAP MEETS EACH FALL PACIFICON takes over a hotel for a weekend. Hundreds of HAMs come to learn and buy from vendors. A number of clubs have a once a month in good weather swap meet to trade and sell equipment and parts. CW or CONTINUOUS WAVE, sometimes called MORSE CODE is no longer part of the HAM or Amateur Radio test. CW needs very little in the way of equipment and can be heard when no other information is coming through. Ham jargon would call an operator working CW, "using his fist". While one should never say "Never", I doubt I will ever use CW for entertainment purposes. A great story, a guy in Arizona broke his leg high on a mountain. He used a wire and his car battery to make a spark and thus sent a CW message. It was heard and he was rescued. DIGITAL TRANSMISSION. Along with AM, FM, there is now multiple digital modes. DMR, D-STAR, and FUSION, are incompatible competing modes at least in 2019. This field and modes are exploding. DMR is Motorola. My ICOM, IC-7100 is a D-STAR rig. Fusion was developed by Yaesu. For old timers, this is very comparable to VCR and BETA systems. Another digital mode that is exploding on HF is FT8. Within comfortable transmission distance, 66 miles of my home there are about a dozen D-STAR repeaters. Quick story, I was at HRO (Ham Radio Outlet), about a mile from Disneyland, listening to D-STAR, A station in Florida was talking to Europe and we were listening on a machine about half the size of a pack of cigarettes in California. There are now about 2000 reflectors or repeaters across the world and more being added monthly, that are linked. D-STAR has been around for more than a decade. A HT not much larger than a pack of cigarettes can now reach the world in digital FM clarity. There are now a plethora of digital modes. My first two contacts from my home in California were to Germany and South Australia in clear FM quality. Enclosed below are some of the digital modes I personally use or have interest. DMR This is a working webpage and is part of the Digital Transmission above. FT8. I began hearing about FT8 about a year ago. It is sweeping HF with regular reports of US to Europe QSOs. I know nothing about digital and less about FT8, but I am learning. DIGITAL TRANSMISSION USING LAPTOPS. Along with AM, FM, this mode is an alternative. This mode uses equipment I have around the house. Nothing unique is needed. Laptop downloads fldigi.com and sound goes to > transmitter > across air > to receiver > to laptop. We talk with our fingers, reading the text. FLDIGI The Contra Costa Sheriff's Department Emergency Communication Unit uses FLdigi. I tried for two years to use this very complicated program, needing to download upgrades every week to a month. Good program but lots of unique parts and I finally walked away from the Unit and FLdigi. FSQ very similar to FLDIGI and can be downloaded there. DIGITAL HOTSPOTS This is a working webpage and technically should be part of the Digital Transmission above. This is a little interface between my Digital radio whether DMR, D-STAR or Fusion and the Internet. DX is radio shorthand for Long Distance. While I have listened for years to HCJB in Ecuador, TWR in Bonaire, Radio Moscow and Radio Netherlands and many other stations. My best QSO, or conversation back and forth was late one Saturday evening, I turned on my transceiver and talked to a gentleman in Connecticut from California. When the Sun Spots are in Amateur Radio favor, I have talked many times to Texas on 20 meters. We have always used a TV antenna instead of paying for cable. I have watched Channel 46 in Fresno, 36 in San Jose, Channel 50 in Santa Rosa, 22 in Rohnert Park, and Channel 2 in Redding and Reno (depending on how the antenna is turned). Karen can watch around 20 digital channels. EARTH MOON EARTH One of the facets of Amateur Communication I am trying to learn everything about is EME. Bouncing a beam from my back yard to the moon and back, or to another station in Europe or South America. This usually takes some knowledge of Astronomy, excellent equipment, good ears and is frequently done in CW mode. ECHOLINK Electronic format I use on my cell phone but can be used from laptops. It turns my cell phone into a HT (walkie-talkie) and I can talk from anywhere with a cell tower connection to anywhere else in the world with a Echolink connection. I must have and use my FCC Amateur call sign when using my cell phone to Amateur repeater. ELMER Helping others become HAM's, this is also called an "Elmer". My elmer in HF was Dave, N6YYM, he was a retired painter by trade, and as good a HF man as I had the opportunity to know. Unfortunately, N6YYM went SK (Silent Key) in February, 2005, and I truly miss his friendship. I have been an elmer to several people over the years getting into Amateur radio at the VHF level. EMERGENCY COMMUNICATION for 25 years I was a member of the Contra Costa RACES (ACS) group. I have a chit that tells me I worked the Oakland fire of '91. and passed the FEMA RADO course and IS-100, IS-200,and IS-700. We started as an Ad hoc group of friends and it has slowly evolved into a group of unpaid Sheriff officers that have to buy their own uniforms and use Sheriff radios. I am a radio man not a cop-wanta-be. EMERGENCY DRILL ON LIKE TAHOE Be aware the term HF or High Frequency is a specialized term. It refers to what was once shortwave, between 3 and 30 MhZ. 20:20 Side Winders On Two, 144.230 USB Question I am looking for an answer. Is the Antioch 440.650 repeater still operational? I am less than 10 miles distant as the crow flies and can't get a peep out of it. But the 444.725 repeater in Antioch is loud and clear. I'll put it on the web and someone will know the answer. NON-GOVT EMERGENCY COMMUNICATION CLUB/GROUPS A subset of government emergency communication would include churches and social group communication. Latter Day Saints (Mormons) have a much larger group on the radio each week than the local government. The Northern CA Salvation Army I check in to this net most Monday evenings along with about 50 others Hams and communities. EXPERIMENT with bands, circuits, ideas (as long as they are in Amateur approved frequency slots. I heard of two guys that took a 5 mw laser pointer, took it on one mountain, the other guy went over 100 miles distant to another mountain with a telescope and they communicated via CW with each other...using light not radio waves. FOX HUNT CHALLENGE. Looking for a hidden transmitter that may or may not be moving. GEOGRAPHY finding unique (strange to me) call signs and finding them on a map. I have listened and talked to other HAMs in Asia, Mexico, Canada and the Caribbean. We are going to be on the open ocean (November, 2017) this year and I hope to talk to HAMs on the Maritime Net on 14.300 MHz @ Noon. TRAVELING I have listened and talked to other HAMs in Asia, Mexico, Canada and the Caribbean. We are going to be on the open ocean (November, 2017) this year and I hope to talk to HAMs on the Maritime Net on 14.300 MHz @ Noon. GEOGRAPHY SUBSET TRAVELING AND LANDING IN UNIQUE LOCATIONS WITH STRANGE CALL SIGNS and finding them on a map. HIGH ALTITUDE BALLOONS. The University of Reno, launch NASA approved balloons, run mostly by HAMS, several times a year with They regularly reach 80,000 feet and the highest I know of reached 102,000 feet. It is cool to watch and listen to the Internet version of the 12 to 15 minute flight over mid-Nevada. See also iHAB-7 Search, "high altitude balloon" for alternate videos. HISTORY OF AMATEUR RADIO I went to school in the 50's and was taught about the Heavyside Layer that bounced radio signals back to earth. We now have some 50,000 pieces of garbage in space and call it the Ionosphere. I remember my electronics teacher tell me that we would never put men in space because we needed radio communication and nothing would get through the Heavyside layer. Then we developed polarized microwaves that went though the Ionosphere easier than warm knife thru butter. When I first got into radio 2 meter (144-148 Mhz) was considered experimental and we used 450 ohm wire on our TV antennas. INTERNET HAM RADIO QSONET allows anyone to listen, and I believe anyone that obeys the rules can talk. FCC rules require all Amateurs to use their call sign every 10 minutes, but I don't think this is true online. (Anytime one goes on-air, we need a FCC license. IRLP is the Internet Radio Linking Project. This is a fairly new, form of HAM radio that is 1/2 over the air and 1/2 over the Internet. Using frequencies all Amateurs can use, they send a code and it turns on a repeater anywhere in the world an IRLP repeater is located. It is not unlike Alice stepping in a hole and finding herself in Wonderland. Going to work one morning I heard a gentleman sign on from Brussels and talk about the snow and rain outside his home, while we were wishing for some of his rain here in California. I like to LISTEN or MONITOR or in Ham Jargon, "Sandbag". Shortwave is a world of space, police, fire and foreign radio stations, one never knows what we will hear when we turn on our radio. I listen to the Two Meter Band on my way to work or working at my desk. This is a VHF frequency (144-148 MHz) that only requires a 19 1/4 inch (41 cm) antenna. When I commuted to Vallejo, I would listen to Dean W7LIG (SK), in Nevada many mornings (140 miles) and when I had something to add I could talk to him. I can listen to most transmissions over at least 100 mile radius on the repeater and there is almost no static. On rainy days, it is not uncommon to know far more about the weather than even my weatherman as everyone reports in, where it is raining and where the accidents are on the freeway. You can't do this on the Internet. With my Yaesu VX-3R I can scan for police reports, business bands. When I worked in Vallejo I was only about a mile from a major USA amusement park, I could scan for Bugs Bunny and the other characters singing. The other night, I heard several friends talking simplex on a legal, but non-authorized place on the band. I enjoy LISTENING TO SPACE. I have a patch that indicates I listened to the Space Shuttle while in orbit. At any given time there are dozens of microsatellites that we can listen to everything from a beacon to talk to people a continent away. With the new International Space Station and the Phase/// satellite in orbit, I expect Amateurs will be talking on a regular basis into space. LISTEN IN ON AO-91 PASS ON JULY 3, 2018 Suitsat1 in April, 2013, took a decommissioned space suit, put a Ham radio inside and the suit was thrown out into space. I believe I heard it, which is a once in never experience. For the SCIENCE OF IT! Covers of Amateur Radio magazines I am currently using for a seminar include Counting Sun Spots in the January, 1998 QST magazine. Transmitting over 100 miles with a 5 mw laser pen between mountaintops in CQ/VHF, March, 1999. Many to most of the items on a radio like automatic volume control, Digital tuning. Repeaters if you live in smaller US towns for FM reception and much more come from Amateur's experiments. MODEL AIRPLANE & CAR enthusiasts can be found on six meters. It takes a license to use this band, so some of these ladies and gentlemen choose to become HAM's so they can use this and other bands to run their remote controlled vehicles. They can add a TV camera to their remote controlled vehicles on microwave, thus using two frequencies at one time. PLAY WITH NEW BANDS 1.25 METER BAND At one time most of my equipment was Yaesu. Now I use what is available for my pocket book. I use an Alinco DR 235 Mk /// and Wouxun 2/222 rig on 222 Mhz. I was strongly advised not to buy this rig, that "no one was on it." and sometimes that is true. But there are several repeaters in our area and a guy a mile or two away is frequently on. We have become fairly good friends and I never would have met him, had I not had this rig. I also have a Wouxan KG-UV3D, HT I find easier to hold, use and program. Brand new to me as of July, 2017. Still don't have it on the air. My favorite rig when I am home. I can listen to two frequencies at the same time and usually do. This rig was given to me by KG6AUA and KG6ATN. At one time we, KG6FPX and I talked to them as we were all driving around after school. When a car was wrecked, they gave the rig to me and it has a super front end. This radio is installed permanently in my car and it pulls in simplex stations much clearer than any of my other rigs. It is on my desk. I use it when my Wouxun won't reach. I have had several FT-60(R) models over the years. Went to an emergency meeting one night and almost everyone in the room of 30 men had a FT-60R. Excellent rig for 2/440. Both my Wouxun and Baofeng are inexpensive Chinese rigs. I wanted to see how they had improved and use them in their own right. I frequently use this rig over my Alinco to be on a 222 net. From Amazon to my door it was $41. It has almost no weight and fits in my pocket. I have all kinds of frequencies in this for especially emergencies but also for going to the ball game. Q-CODES Government uses 10 codes, "10-4." Amateur Radio has always used Q codes. QRP is low power. QTH is "What is your location?" This is Amateur radio jargon. These were developed back in the CW days and three letters were easier to send than all the letters in a comment or question. QRP A footnote on CW. Some very hearty folk prefer what is known as QRP. These are transmitters with a maximum power of 5 watts. In a world of big radios and transmitters, they go small. I have a friend, AB6MB that rarely uses more than 2 watts and in a 1998 contest, "talked" to 12 states in 24 hours. By the way, he did this in the back of an old VW bus in a state park not far from our home. I heard of a contact between California and Japan using only 12 milliwatts and was powered by an AA battery in a tuna can! MINIMALIST QRP Using the fewest number of parts to make a RF signal another can hear. ULTRA QRP Whether a 5mw LASER or a 12 mw tuna can station Ultra stations never go over 1 watt and attempt to work on under 100 mw of power to talk to the world. RAGCHEW Have someone to talk to on sleepless nights. One night I helped a fellow XYL (Previous Young Lady or married woman) who was having trouble with her medication. She is blind and she didn't know if she had taken too much or too little medication. We talked as I did my paper route for about half-an-hour until the possible crisis passed. I could have used my autopatch to call for emergency help half a state away. REGULATE We self-regulate ourselves. We have rules in the FCC Part 97. We must use our Amateur Radio license call sign at the beginning and every 10 minutes of talking. We don't swear. We don't play music. For a while, there was a guy in San Francisco that would sign on with a five minute, day, date, address, etc and etc. We tutored him, he continued, we ignored him and he went away. No one wants to transmit and get silence back. We regulate and keep our Ham frequency clean and legal. REMOTE CONTROL MODEL CARS/AIRPLANES. While there are a number of frequencies model airplanes can fly on, most are very limited. Some amateurs use the six-meter band which will allow some of these huge planes to travel fifty and more miles from where the control pilot stands with their controls. REPEATERS is another form of Amateur Radio. Repeaters are "machines" on the top of towers, mountains or even satellites in space, that make communication of short, shortwave possible over long distances. Some repeaters allow an Amateur to connect with the phone grid. About once a week, I have a reason to call my wife. I can do that almost anywhere within 100 miles of home at no cost to me. SATELLITES Satellites fly overhead every 90 minutes and are frequently closer than stations we are talking to on earth. Most classes of Licenses can talk to and from satellites legally. Many of the Astronauts and Cosmonauts have Amateur Licenses and talk back to earth. I have a patch that says I talked to one of the earlier space shuttles. You can also download satellite weather pictures. SIMPLEX it is like holding a conversation in the same room with someone. SIMPLEX is simple, We talk radio to radio without using high power, repeaters, or the internet, just two people and two radios. HF is almost 100% simplex. VHF/UHF has at least a dozen modes to talk to many at one time via repeater, digital, etc. 4. Still digital images (JPEG files) transmitted over packet networks. Also called facsimile, it can be received by either computer or fax machines. 5. One of the newest technologies virtually invented by Amateurs, is digital video images. Two Amateurs on November 25, 1998 using PCMIA wireless LAN computer boards, have transmitted digital images up to 1600 feet @ 28.8k. 6. Internet Want to look at my mug shot on the Internet? Packet radio for short. This is an item not unlike a modem in a computer. The TNC goes between the Transmitter/Receiver and the computer. One of the Amateurs I communicate with via the Internet has his packet station connected to the Internet. Packet is free, once you have the equipment and is not hardwired to a wall, like most of us on the Internet. With a battery, many packet stations are quite mobile. As mentioned at the beginning of this section, there are almost as many ways to use an Amateur License, as there are Amateurs. Come join us in this hobby that got its boost in the Titanic Disaster and is as current as satellites. This web page is in constant change. I began this HTML page in 1996 and as I learn I improve the page.